We invite you to partner with us in a legacy of reaching the unreached souls of our world till Jesus comes. Click the box below, review the beautiful brochure and learn a 3-step strategy to achieve this marvelous goal. In the past 17 years, through the strategy of the Witness Project, over 40.7 Million souls have been reached in 82 countries. It is exciting, by faith, to anticipate what our combined efforts will accomplish in the next three years.Â The part that you play in this campaign is vital!Â It cannot be accomplished by anyone else. May God bless your prayerful consideration. Together we can see this miraculous vision become a reality -- by following God's plan of multiplication. The strategy that you will review in the pages of the brochure is already working! Each believer's involvement will build upon an established foundation and your investment in this campaign will determine our combined success. To reach our goal, we must each do our part. The key to succeeding in this undertaking is for God's people to unite their efforts and to approach this need with a positive attitude -- an attitude that clearly states the fact that whatever it takes, we will accomplish our goal. God can enable the unable, but He cannot and will not enable the unwilling. "Jesus's love is small enough for just one! But large enough for the whole world!" Accordingly, there is no gift too small -- or too large-- not equal giving, but equal sacrifice. 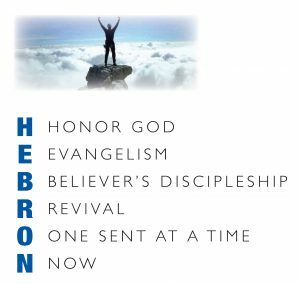 Click below to learn of the OPPORTUNITY the HEBRON INITIATIVE gives you to establish a Legacy of Souls.